Ivanoska graduated with a BA and MFA from the Faculty of Fine Arts in Skopje. 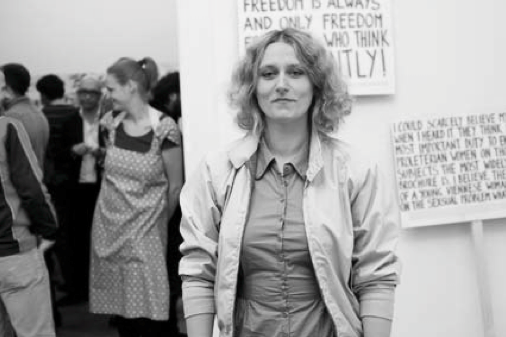 She has exhibited in a number of individual and group exhibitions and projects in Macedonia as well as abroad, such as Bucharest (2013), Graz (2013, 2009), Berlin (2011, 2008), Moscow (2010), Stockholm (2008), Ljubljana (2008), Belgrade (2007), London (2006) and others. She was awarded a reserach residence via ArtsLink at the Cleeveland Institute of the Arts (2004) and was an artist in residence at IASPIS, Sweden (2008). Ivanoska works on collaborative projects with Yane Calovski since 2000; in 2004, they estblished Press to Exit Project Space, a platform for artistic research and curatorial practices.